There's always been plenty of Guy Gavriel Kaye books around the Parentals' house, but I have never managed to pick one up and actually read it- until now. I don't really know how to categorize The Lions of Al-Rassan, either- it's not fantasy in the traditional sense, so don't expect elves, orcs, dwarves and the like- but it's not straight historical fantasy either, for while the realm of Al-Rassan might bear a resemblance to medieval Spain, it's not quite an exact parallel either. The empire of the ruling Asharites has decayed and the once powerful land of Al-Rassan has crumbled into a series of warring city states and petty kings as the story opens. A shocking act of violence ordered by the increasingly powerful King of Cartada, throws together Rodrigo Belmonte, the most fearsome commander the Jaddites of the north have, the court physician Jehane and the poet and assassin Ammar Ibn Khairan. As the chaos in Al-Rassan grows and the last remnants of the once great kingdom are threatened by forces within and without- Belmonte and Ibn Khairan find themselves serving the same master for a time as Jehane finds herself increasingly torn by her growing feelings for both men. But even as the fates of all three become increasingly intertwined, events outpace them all to tear them asunder as the fate of Al-Rassan itself hangs in the balance. (Yes, I know that's a pretty generic plot summary, but bear with me.) Where to begin with this book? Well, the writing is mind-blowingly good. You feel like you're reading a dense, complex book- but in reality if you step back and look at it, the language is somewhat spare and deliberate- you feel like not a chapter is wasted and not a word is out of place, which just increases the power of the narrative. While I found the majority of the book to move at a fairly sedate, steady pace, Kaye trips events into fast-forward for the last third of the book and I found myself somewhat stunned to realize that I was emotionally invested in these characters in a way that I haven't experienced in a long time. This is an incredibly written book. 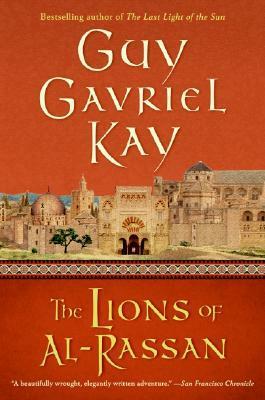 If you love good writing and haven't picked up Guy Gavriel Kaye yet- move him to the front of your reading list and do so. You won't regret it. While Al-Rassan isn't an exact clone of medieval Spain, the historical parallels are interesting and don't take a History degree for the reader to pick up on. The ruling Asharites find their parallel in the Islamic rulers of long-ago Spain. The Jaddites of the north and their three kingdoms? The Christian Spanish and Castillo, Leon and Aragon. Jehane and the Kindath are obviously meant to be Jewish. Kaye's obviously deep knowledge of the 'source material' he is drawing upon only helps to deepen the effectiveness of the narrative. Kaye aims for big, grand, epic and a story that transports the reader to another world and more than reaches his goal- he nails it to the wall. It's been awhile since I've seen El-Cid, but there's a haunting element of tragedy and melancholy from that movie that you can see touches of in this book, with characters concerned with honor and battling their feelings and their duty- yet despite that, the characters also feel well-rounded and real. The marriage between Rodrigo and his wife Miranda is just about perfect (Miranda is probably one of my favorite characters in the book.) Though the relationship between Ammar and Jehane and how that evolves over the course of the book is probably a close second. If you read this book and reach the end underwhelmed by Kaye's writing or the incredible narrative he waves throughout the course of this book, the ending will convince you. He leaves the reader hanging with one hell of a cliff hanger and then flings two decades into the future for an epilogue that takes it's sweet time about answer a question the reader is dying to know before ending with a mournful image that ties back to the very beginning of the book in a truly exquisite way. Overall: It's been a long time since I've been so thoroughly engrossed and entertained by a book and it's been an even longer time since I found myself so emotionally invested in a book and it's characters. Oh and if you were curious, Guy Gavriel Kaye can write. I've got at least three books on my menu to tackle, but once those are done, I think I'll have to find another of his books and give it ago. But in the meantime, **** out of ****. If you're a fan of fantasy, historical fiction or just plain good writing, find this book and read it. You won't regret it. Does Your Campus Have A Food Pantry? Why Not A Real Democracy?